pseudoparanormal: $cientology: follow your path to an empty wallet. In December 1953, L. Ron Hubbard founded the Church of Scientology in Camden, New Jersey (yes, this one hits close to home). The church and its practices are based solely on Hubbard’s writings on Dianetics, or a discipline designed to heal psychosomatic illnesses by cleansing the mind of harmful mental images. Interestingly, for most of his early life, L. Ron Hubbard was a science fiction writer. He never studied biology or medicine, and instead studied to be a civil engineer. Further, he received poor grades during college and was put on academic probation. On February 10, 1953 Hubbard was awarded an honorary Ph.D. by Sequoia University, California, "in recognition of his outstanding work and contributions in the fields of Dianetics and Scientology." This non-accredited body was closed by the California state courts 30 years later after it was investigated by California authorities on the grounds of being a mail-order "degree mill". In 2009 The Times revealed that the British Government's Department of Health had investigated the provenance of this degree, and had concluded that Hubbard had bought Sequoia University and awarded the PhD to himself. Starting to look fishy? I thought so, too. So here it is, straight from the horse’s mouth. So you want to free your soul by gaining wisdom? Alright, fork over a few thousand dollars and we can start! This is where Dianetics, or Scientology’s version of medicine comes into play. Medical claims are a particularly controversial area of Scientology. They include a process of many steps that one must go through to advance to the next level of “knowledge”. One of the basic principles of Dianetics under the religion of Scientology is Operating Thetan, or “the spiritual state of beingness above Clear”. Thetan refers to the spiritual being, and operating means “able to operate without dependency on things.” An Operating Thetan (OT) is able to control matter, energy, space and time rather than being controlled by these things. As a result, an OT is able to be at cause over life. The “trained professionals” in Church of Scientology that lead followers through these series of steps use a device called an E-meter (Hubbard electrometer). This device is described as "a religious artifact used to measure the state of electrical characteristics of the 'static field' surrounding the body" (The device is not at all an “artifact” and is actually manufactured by the church). The meter measures galvanic skin response (GSR) and is believed to reflect or indicate whether or not a person has been relieved from spiritual impediment of past. Hubbard claimed as so sensitive that it could measure whether or not fruits can experience pain, claiming in 1968 that tomatoes "scream when sliced." In 1963 the FDA investigated these claims during a surprise raid on the Church in Washington, DC and confiscated all E-meters on the premises. The FDA filed suit against the Church of Scientology for fraudulent medical claims and called the E-meter a fraudulent healing device. The court ruled that the Church was to abide by certain conditions and now each e-meter includes such a disclaimer on it. So let’s review the Scientology in terms of pseudoscience: Vague phrases like “beyond words” and “human spirit” are used and are typical of pseudoscientific claims because they cannot be disproven; extraordinary claims like “controlling matter, space, and time” are present and are surely not attainable no matter what the price; and it appeals to higher authorities (well, at least those with false degrees). 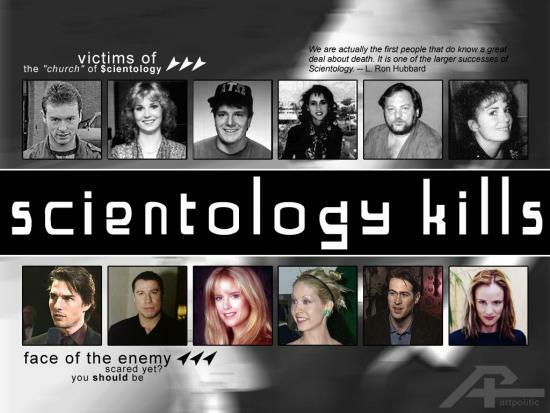 There is so much more information exposing Scientology that has come to light in the past few decades. Stories of $300,000 bills for “medical counseling” that a member receives when leaving the church, tales of families torn apart by overbearing leaders, and even deaths related to Scientology. Yes, it’s funny when Tom Cruise (a well-known Scientologist) goes bonkers on TV, but the reality of this brain-washing cult posing as a religion is the furthest from funny. Thank you for the link! I actually saw that as well on the tv at the gym (on CNN) the day after I posted it. However, I couldn't hear it so it will be nice to watch the video again. Im a firm believer in the idea of human stupidity, It truly is fascinating the lengths at which people will go to save there soul. religion has mastered the art of implementing fear into a persons soul to benefit themselves. Its almost unheard of today of people thinking for themselves and trying to make peace with there lives without the aid of false prophets, but again they do say ignorance is bliss. maybe the people who toil day and night looking for the truth are the ones who are really the fools?